Western blot analysis of extracts from various cell lines using PTPRF/LAR (E6W4X) Rabbit mAb (upper) or β-Actin (D6A8) Rabbit mAb #8457 (lower). Immunoprecipitation of PTPRF/LAR from ACHN cell extracts. Lane 1 is 10% input, lane 2 is Rabbit (DA1E) mAb IgG XP® Isotype Control #3900, and lane 3 is PTPRF/LAR (E6W4X) Rabbit mAb. 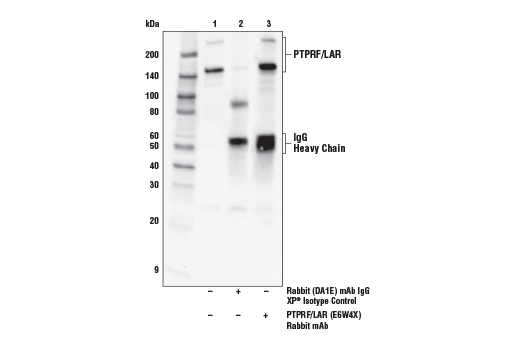 Western blot was performed using PTPRF/LAR (E6W4X) Rabbit mAb. Anti-rabbit IgG, HRP-linked Antibody #7074 was used as a secondary antibody. 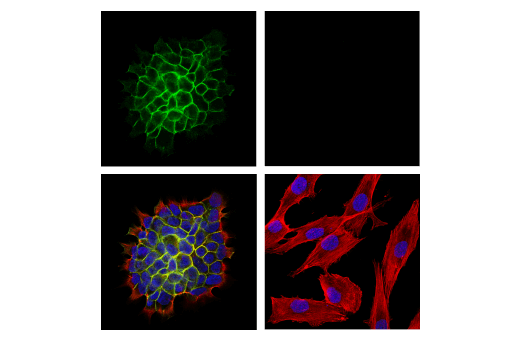 Confocal immunofluorescent analysis of RT4 cells (left, positive) or U-138 MG (right, negative) using LAR (E6W4X) Rabbit mAb (green). Actin filaments were labeled with DyLight™ 554 Phalloidin #13054 (red). Samples were mounted in ProLong® Gold Antifade Reagent with DAPI #8961 (blue). 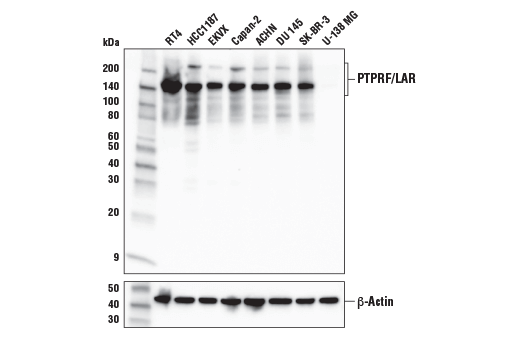 PTPRF/LAR (E6W4X) Rabbit mAb recognizes endogenous levels of total PTPRF/LAR protein. This antibody detects the E-subunit of the processed PTPRF/LAR protein. Monoclonal antibody is produced by immunizing animals with recombinant protein from a central region of the human PTPRF/LAR protein. Receptor type protein tyrosine phosphatase F (PTPRF, LAR) is a transmembrane PTP that helps to regulate insulin signaling, cell proliferation and cell migration. The PTPRF protein is composed of an extracellular segment that contains several Ig-like and fibronectin (Fn-III) domains, a transmembrane region and a pair of cytoplasmic phosphatase domains (1,2). Functional studies reveal that the membrane-associated D1 phosphatase domain is responsible for substrate dephosphorylation, while the D2 domain is important for substrate specificity (3). PTPRF negatively regulates insulin signaling through dephosphorylation of insulin receptor and insulin receptor substrate (4). This phosphatase activates the pro-apoptotic DAPK serine/threonine kinase by removing a phosphate at Tyr491/492, while the kinase Src replaces the phosphate to inactivate DAPK at the same time it down regulates PTPRF expression (5). PTPRF is commonly found at focal adhesions where it interacts with liprin, which localizes the phosphatase to the membrane, and the Rac/Rho family GTPase Trio (6). Localization of PTPRF at adherens junctions results in PTPRF modification of β-catenin, which inhibits cell migration by limiting the amount of available cytosolic β-catenin (7). Cheng, A. et al. (2002) Eur J Biochem 269, 1050-9. O'Grady, P. et al. (1994) J Biol Chem 269, 25193-9. Tsujikawa, K. et al. (2001) Mol Endocrinol 15, 271-80. Zhang, W.R. et al. (1996) Mol Endocrinol 10, 575-84. Wang, W.J. et al. (2007) Mol Cell 27, 701-16. Stoker, A.W. (2005) J Endocrinol 185, 19-33. Müller, T. et al. (1999) J Biol Chem 274, 10173-83.